Turkish fighter jets continue to pound Kurdish fighters as it becomes clear Ankara's main target Kurds not ISIS - which it cooperated with. Turkey has killed 260 Kurdish militants in a week-long air offensive on targets in northern Iraq, official media claimed Saturday, as regional Iraqi authorities said it was time the rebels pulled out with concerns growing over civilian casualties. Ankara has launched a two-pronged "anti-terror" offensive against Islamic State (ISIS) jihadists in Syria and Kurdistan Workers Party (PKK) militants based in northern Iraq after a wave of attacks inside Turkey. But so far the bombardments have focused far more on the Kurdish rebels and a report by the official Anatolia news agency of 260 alleged PKK militants killed was the first concrete indication of the scale of the casualties. 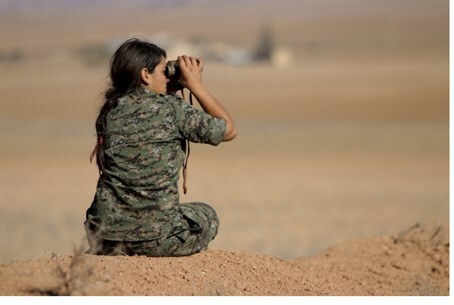 The Turkish strikes against Kurdish forces come as critics say Ankara is using backlash against a massive ISIS suicide bombing late last month to crack down on the Kurds, in a move that comes after Western officials revealed Turkey has been cooperating with ISIS. Turkish F-16 jets carried out more air strikes Saturday morning, NTV television said. On Friday, 28 Turkish F-16s destroyed 65 targets of the PKK including shelters and arms depots, following the heaviest air strikes the day before when 80 Turkish aircraft hit 100 PKK targets, Anatolia said. "For the peace and security of our people, the fight against terror organizations will continue without interruption," the office of Prime Minister Ahmet Davutoglu said in a statement. The PKK's insurgency for greater rights and powers for Turkey's Kurdish minority, begun more than 30 years ago, has left tens of thousands dead. A ceasefire declared in 2013 has been shattered by the current violence. Turkey's Kurdish militants have sought cover in neighboring northern Iraq where the presence of the PKK has long been tolerated in Iraqi Kurdish-ruled region. More fighters also crossed into the area from Turkey as part of the 2013 ceasefire. Yet the PKK's relations with the autonomous Iraqi Kurdish authorities in Arbil have been beset by tensions, while Iraqi Kurds have expanded economic cooperation and relations with Turkey. The office of the region's president Massud Barzani said in a statement Saturday that the PKK rebels should move out of the region to prevent civilian casualties. "The PKK must keep the battlefield away from the Kurdistan region in order for civilians not to become victims of this war," it said. The Kurdistan Regional government issued a slightly softer statement urging the PKK to keep its "forces...away from populated areas." Iraqi Kurdish officials said Saturday six people had been killed in a pre-dawn strike by Turkish war planes on the village of Zarkel and there have been reports of civilian casualties. The pro-PKK Firat news agency described the attack as a "massacre" which had left at least nine civilians dead. There was no comment from the Turkish military. Kifah Mahmud, a Barzani adviser, told AFP that "if the PKK did not have bases inside the region, Turkey would not be bombing civilians." Without citing its sources, Anatolia said that among those wounded in the northern Iraq strikes was Nurettin Demirtas, the brother of the leader of the pro-Kurdish Peoples' Democratic Party (HDP), Selahattin Demirtas. "Up until now 260 terrorists have been rendered ineffective (killed) and 380-400 terrorists have been identified as injured," Anatolia said. Demirtas openly acknowledges that his elder brother Nurettin had gone to the Kandil Mountain in northern Iraq where the PKK's military headquarters are based. But he said Sunday he could not confirm the Anatolia report as Nurettin had moved on. He is "resisting ISIS on behalf of the people," said Demirtas, without giving further details. The Turkish authorities have also been upping the pressure on the HDP with prosecutors opening criminal investigations against both its co-leaders. The HDP has angrily claimed that the current security crisis was provoked by President Recep Tayyip Erdogan to call snap elections and avenge the ruling party's disappointing performance in June 7 polls. Demirtas said Sunday that a legal adviser to Erdogan, Burhan Kuzu, was planning to close the party possibly "by the end of the year." "We will stop this fascist approach," he said. Meanwhile within Turkey at least 14 police and soldiers have been killed in attacks blamed on the PKK in the last 10 days in an escalating cycle of violence. A Turkish soldier was killed Saturday in a mine attack in the Kars region of northeastern Turkey, NTV television reported. In the Catak district of the Van region in the east of Turkey, two suspected PKK members were killed overnight when they tried to attack the local police headquarters, Anatolia said. It said a total of 10 "terrorists" had been killed in clashes in Turkey over the last days.